The first-ever United Nations summit on oceans wrapped up in New York last week, with an agreement to reverse the decline of our ocean's health. Returning from New York, EJF is reexamining the SDG's a the vital role that ending illegal fishing will have in securing sustainable oceans for all. Seventeen years ago in New York our world leaders made a historic joint commitment on development. It was a bold vision of the future, with ambitious but achievable targets. The Millennium Development Goals - or MDGs - helped to drive action on development; they saw a reduction in poverty, increased access to education and greater gender equality. But many of their targets remain unmet and millions of people around the world continue to live with this reality – a life without sufficient food, clean water, access to healthcare and education. Two years ago, governments met again in New York, and with the aim of learning from the successes, and the failures, of the MDGs they agreed a new set of similarly ambitious targets. Unlike the MDGs before them, the Sustainable Development Goals - the SDGs - aim to promote a more holistic approach to development, incorporating issues such as human rights, economic development, sustainability and the environment. At EJF we recognise the direct link between environmental security and people’s livelihoods and wellbeing. We understand that our collective short-term thinking and mismanagement of natural resources - whether it’s the theft of marine resources by illegal fishing operators or the destruction of key ecosystems to make way for commercial food production - are extinguishing our planet’s life support systems and, for many people, are the driving force behind widespread poverty and hunger. It is for this reason that EJF believes the environment, and its protection, should be central to all our efforts to eradicate poverty and support development. It is no exaggeration to say that fishing is a lifeline to hundreds of millions of people around the world. Nor is it an exaggeration to say that the future of this source of food and income is at risk of total collapse. With one in six people dependant on fish as their main source of animal protein and over 80% of global fish stocks believed to be overexploited or fully exploited, the need for meaningful action could not be more urgent. Pirate fishing is one of the greatest hurdles to overcome in the fisheries sector. Often contravening international and national regulations, using banned fishing gear, targeting protected species or fishing in protected or restricted areas, pirate fishing operations look to cut costs and maximize profits at the expense of the economy and the environment. 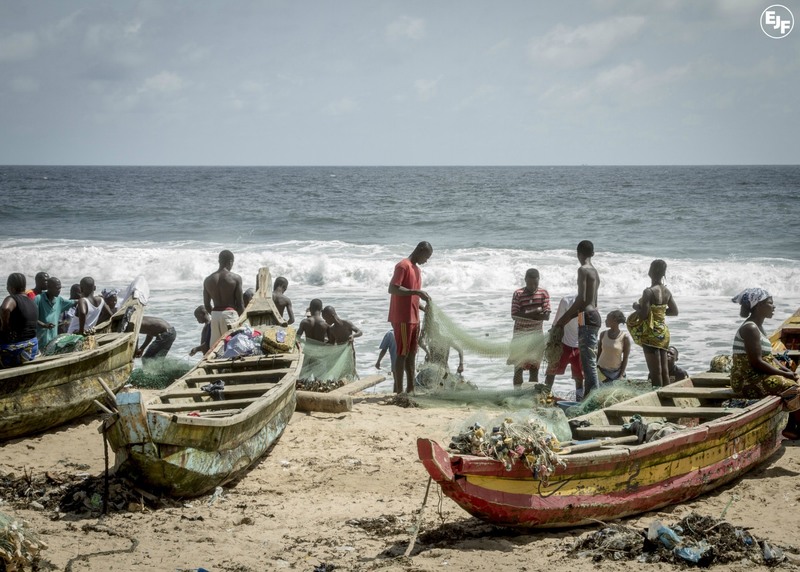 It is estimated that between US$10 billion and US$23.5 billion is lost to pirate fishing each year and the bill for this is being footed for the most part by those who can least afford it, in West African countries like Sierra Leone. The ecological footprint of illegal trawling in Sierra Leonean waters is huge. During one joint arrest of a pirate vessel with the Republic of Sierra Leone Armed Forces (RSLAF) Maritime Wing, EJF observed crews discarding up to 75% of their catch; juveniles, commercially ‘valueless’ species, and the finned bodies of sharks and guitarfish, which were thrown back into the ocean, dead. This kind of unselective fishing in ecologically fragile coastal waters is decimating fish stocks. The rapid depletion of fish populations jeopardizes the livelihoods of the 30,000 artisanal fishers and 200,000 workers in employed in processing, distribution and elsewhere in the wider seafood sector. Sierra Leone is estimated to be losing US$29 million each year to illegal fishing; but it is not alone. EJF is witness to similar trends across West Africa. In total, illegal fishing is estimated to account for annual losses of US$1.3 billion in the West African region. Perhaps more frightening however, is the nutritional deficit that communities suffer as a result of decreasing catch sizes. In communities where fish represents over 50% - and as much as 80% - of the average person’s animal protein consumption, a threat to fish stocks is a direct threat to food security and health. SDG 14 aims to tackle this issue. It’s objective: to “conserve and sustainably use the oceans, seas and marine resources”. But achieving this goal will not be an easy task. In fact, experts warn it could be one of the most difficult of the SDG’s to achieve. Meeting a key indicator - to “sustainably manage and protect marine and coastal ecosystems” - would require a complete reversal of current trajectories. EJF strongly believes that the failure to urgently curb illegal fishing will undermine efforts to achieve sustainable fisheries management and in turn, the prosperity and development of some of the world’s poorest countries. Ultimately, ending pirate fishing will be key to achieving SDG 14. EJF’s message to world leaders as they move to implement all of the SDGs - and most notably SDG 14 - is an appeal for them to show a greater commitment to protecting the environment and ensuring the sustainable management of its resources. We simply cannot afford to be complacent anymore. Protecting the environment may be our greatest hope for achieving equitable, sustainable development for all.